Don't wait for the top of the hour, delight your guests with one push of a button. Your guests will be truly stunned when they see your new Musical Motion Clock from Rhythm.A Rhythm masterpiece. The Golden Stars is a stateof-the art creation comprised of 30 melodies. On the hour, the dial opens and splits into three sections revealing five golden bells. The attractive, champagne-colored, contemporary frame along with the Swarovski crystals and gold and silver accents, make this clock a truly graceful addition to any home. 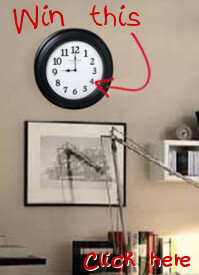 Clock is battery operated with a Quartz movement.